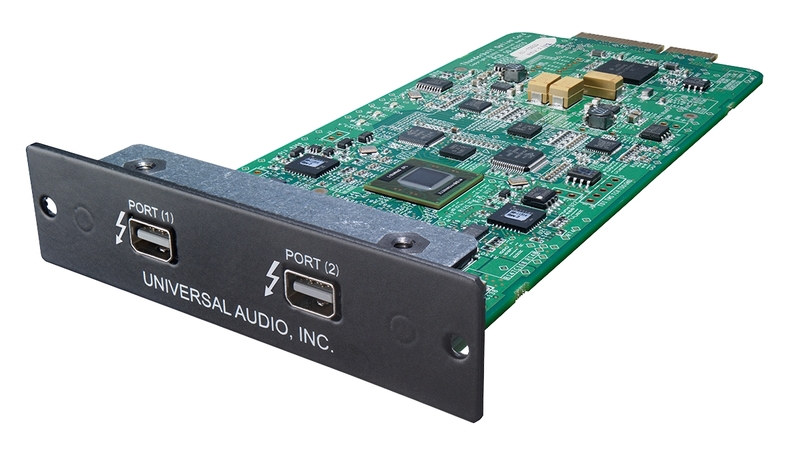 Thunderbolt means serious I/O for UA’s DSP-based processing on the Apollo card – even on a lowly Mac mini. Image courtesy Universal Audio. Universal Audio is first out of the gate with an audio interface add-on that uses Intel’s Thunderbolt bus, the high-performance, low-latency connectivity option on current iMacs, MacBook Pros and Airs, and Mac minis (though, conspicuously, not the ever-more-outdated Mac Pro). The solution isn’t the most elegant – you need to add in an option card with an included tool – but once installed, Thunderbolt appears right in the box (see image below). And what can you do with all that extra bandwidth? On the Apollo, you get better performance even as you push the envelope with sample rates, and more instances of those DSP-hungry modeled effects and such. Perhaps most compellingly, you get to reduce latency, compared even to FireWire. Apollo can also be one stop in a chain of Thunderbolt goodness, since there are two ports and bus power flows to downstream devices. UA isn’t the only maker eyeing Thunderbolt. Apogee Electronics has promised its Symphony IO will get Thunderbolt, via the 64-channel Symphony 64 | Thunderbolt. Quartet’s bandwidth requirements are comparatively small next to high-resolution video peripherals, and are easily fulfilled by USB 2.0. The latency with USB 2.0 Audio is excellent – just 3.6ms (roundtrip) when recording in Logic at 96KHz/32-buffer. Plus the inclusion of Thunderbolt would increase Quartet’s cost significantly without adding a great deal of benefit. Looking pleasingly like an audiophile stereo system, the Symphony I/O adds loads of ins and outs to the Mac. Count 64 channels on the forthcoming Thunderbolt option. Photo courtesy Apogee. Substitute your audio interface of choice in that explanation, and the same argument holds. In fact, I’ll go out on a limb and make a prediction here. It’s not Thunderbolt that’s likely to be the odd man out in the new I/O options – it’s USB3. Thunderbolt seems the logical high-performance option, and it’s the one for which we’ve seen broad commitment from video and high-end audio vendors. That leaves USB2 as the logical solution for everything else. That could change over time, but I wouldn’t even be surprised if many USB3 devices were released as such only in name, providing performance and bandwidth similar to their USB2 counterparts. Check back here to see if I was correct.